This morning YouTube invited a small group of press to unveil the latest evolution of the site’s viewing experience. It’s called YouTube XL, and it’s going to bring the vast majority of YouTube’s content to your TV or large-screen computer monitor. It’s already live, and you can check it out here. At its core YouTube XL is basically a redesigned version of the YouTube website. It’s still run in the browser, and you don’t have to download anything to get it working (assuming you have Flash installed). It looks (and according to the demo, feels) like a native application. One of the first things you’ll notice about the interface is that it’s very clean. This is due in no small part to the fact that it currently doesn’t have any ads (we can probably expect this to change). But YouTube has stripped out many of the suggested videos, comments, and other content that clutters the main site in favor of a much more streamlined interface that is usable from across the room. One of the most appealing aspects of XL is that it will work on nearly any device that has a browser and can connect to the TV. That means you’ll be able to use it though your PS3 (though it sounds like there are some limitations – for example, the PS3 doesn’t support HD YouTube videos yet). Likewise the Wii will be able to use the new site, but because of its lower hardware capabilities it outputs at at a lower resolution. Of course, one of the most key elements to offering a TV-like experience is the abiity to control the application remotely. You can use a wireless keyboard, but YouTube has developed found something a bit more practical called Gmote, a remote control app that runs on Android phones. You can scroll around menus, and also input text if you’d like to search. It’s only on Android so far, but because it’s open source you can potentially develop for other devices as well. The input is sent over your Wi-Fi network. Update: Gmote is actually a third party application that works well with YouTube XL, but YouTube didn’t develop it in-house. With Hulu’s release of Hulu Desktop earlier this week, and today’s release of YouTube XL, it’s clear that the video wars are going to be fought in the living room over the next few years. 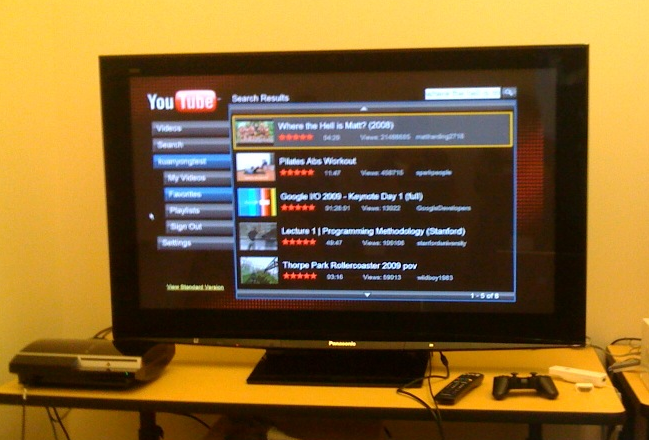 YouTube XL definitely has potential, especially with its integration with the PS3 and the Wii (Hulu Desktop only works on computers). Now the site just needs to work on bringing more premium content to YouTube – it’s fun to watch silly user-generated videos on my computer, but if I’m going to couch surf through YouTube on my big screen TV, I’d rather watch content that’s a little more polished.